Redesigned Interlocking Sign Making Templates are Loaded with New Features to Produce Professional Signs with Ease! 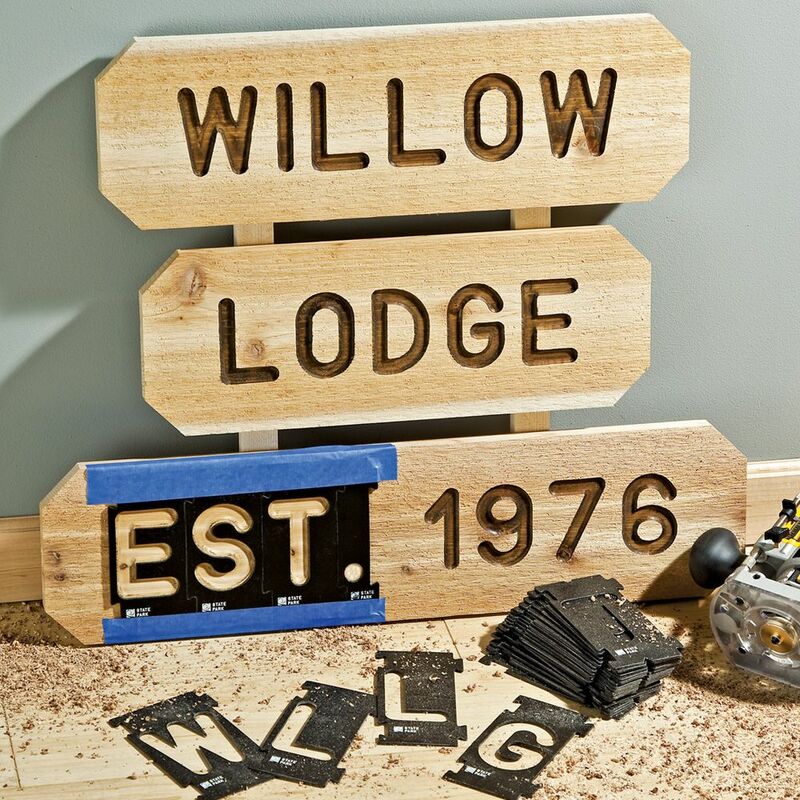 Our Sign Making Wizard is a convenient way to map out your letters. Simply enter your sign word or phrase and the wizard will create a custom routing plan including a visual guide to the sequence of templates needed and the number of passes required to rout the letters. 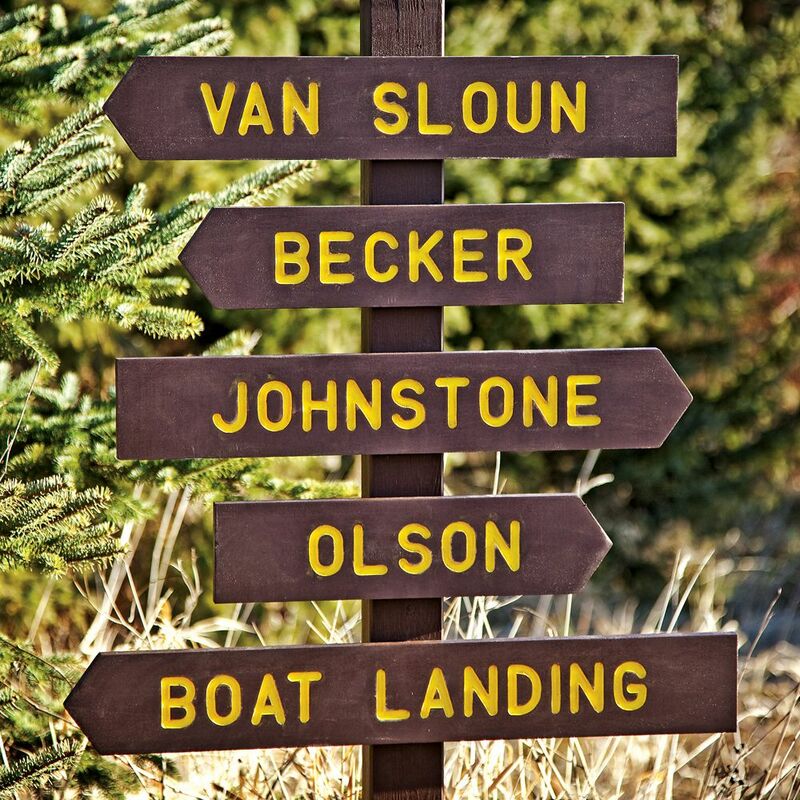 Produce countless enduring, classic signs with our instantly recognizable ''State Park'' Font sign-making system. Our State Park letter templates feature adjustable kerning for the most natural-looking layout of your text, with neat, even spacing between all letters. The kit includes a total of 99 template pieces, with letters, numbers, symbols, and kerning spacers. 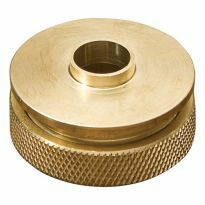 Includes a high-quality brass guide bushing. Recommended for use with a plunge router. Continuous, unbroken letters! 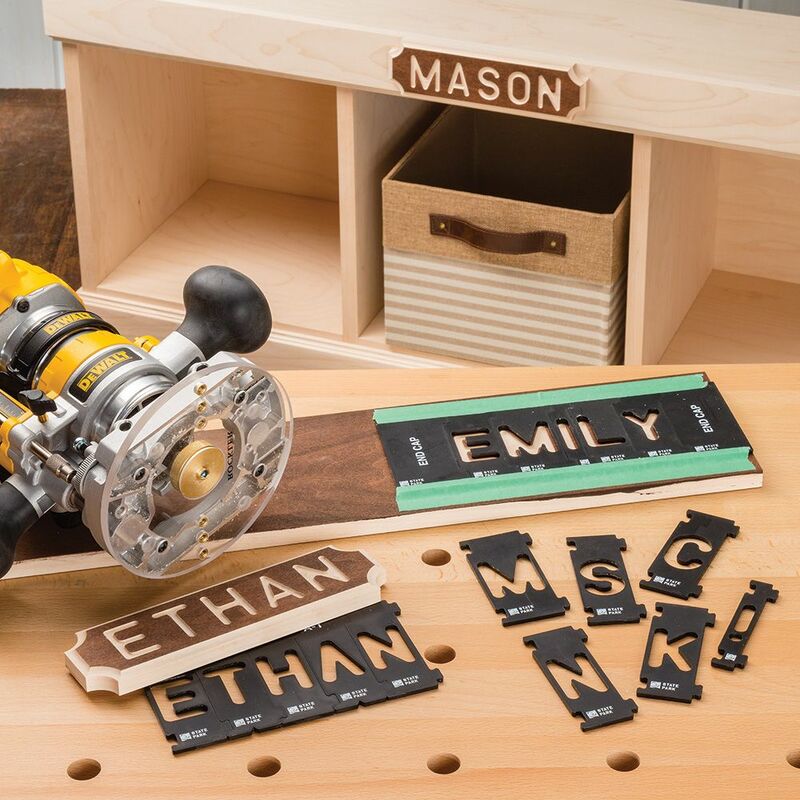 With our clever 2-stage system, you get neat, whole letters, with no seams. There is no need to split letters such as A, B, and D, as a way of securing the ''eye'' in the middle. Kerning provides consistent letter spacing! Adjustable kerning allows letters with top- or bottom-heavy shapes to overlap each others space, eliminating awkwardly large spaces. 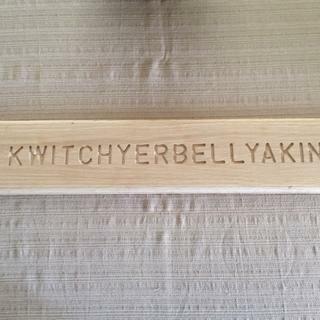 Convenient Sign Making Wizard lets you easily map out your word or phrase! Simply enter the words or phrases for your sign, and the wizard will create a custom routing plan with a visual guide for the sequence of templates needed and the number of passes required to rout the letters. Still not convinced this is the best way to create authentic, unique signs? Read the HomeFixated Review for more details. Works so well. Love the results! My wife wanted an entry way bench with storage below for shoes. 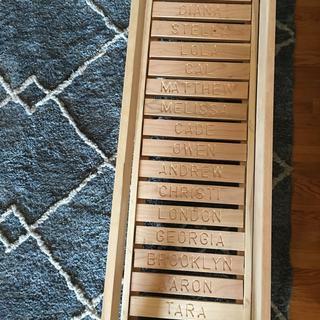 Family names on slats. Works great! I love the look of the letters.The size of the font is really nice looking. You will need to practice, but the learning curve is short, and the results look fantastic. Here are some tips I learned (by doing it wrong first time). (1) Eliminate all movement of the templates. If you simply tape it down it will start to move when you pass the heavy router over it. Some ideas: (a) use (thin) double stick tape underneath the templates; (b) add blanks to the ends of the line (they are in the kit) and either clamp the line in place or run a screw through the blank templates. The online program is essential to get the kerning right, The supplied bushing is sized to fit letters and must be used. With the bushing in place you are flying blind, so practice to get a feel. If you are making a deep cut the trench will fill quickly with wood dust and make movement impossible. The bit recommended should be used: it will make a plunge cut and give you the maximum width. You may need to check base to bit alignment to be sure the bit is centered in the bushing. 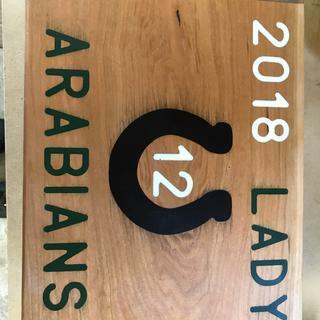 Making signs is really neat. Making signs is really neat. I recently used MDF and it works better than plywood or real wood because the edges are like machined steel, very sharp and crisp. The templates work perfectly and once I got the sequence of moving frequently used letters to the next spot, I can finish a big sign with three lines of 40 or so letters in a day. I found it convenient to get a couple sets of each size to have more letters. This is one of the best and most useful things I have from Rockler. These templates have become a key part of my sign and mailbox business. This font is far superior to other offerings in terms of quality and appearance. A set of number templates for vertical applications would be a nice addition! I highly recommend the State Park sign maker's template. I've been using my set to label toy boxes. This system is very easy to use, especially with the online sign making wizard that gives a visual map of how to lay out the template pieces. This defines the proper sequence of router passes that result in nicely spaced and unbroken letters. I've purchased two sizes of fonts so far, and I'm dreaming up a reason to buy the third size. If you take your time the templates allow you to make beautiful signs. 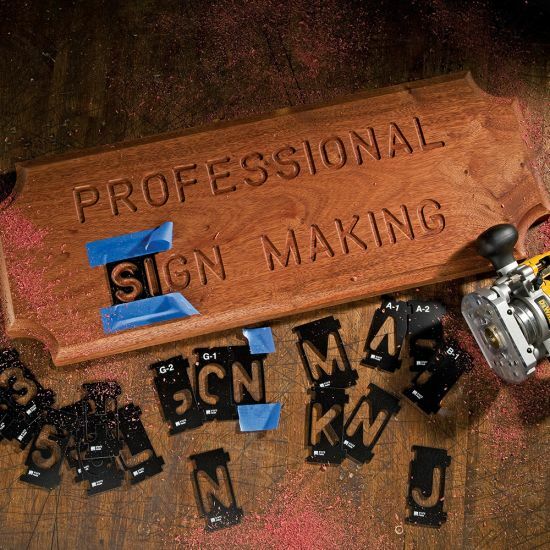 The sign making wizard is an essential component to the process. It makes the layout quick and easy. Fantastic so easy to use and makes professional looking signs right from the start. I wanted to rate this product at 4 and 1/2 stars but that option was not available. The template worked as described and I have no problems with this product. However, I was a bit frustrated when it was time to change from "A-1" to "A-2". I was almost intimidated. A large dose of patience is very helpful, I just don't have that sometime. With all this said, I would recommend this product. 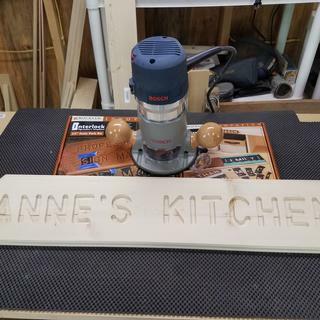 Works great for making signs, I have searched many websites for a set like this and I'm glad I was able to find it on Rockler. I ordered two of these kits and they are both so easy to work with. The set-up is easy and the result is incredible! This creation by Rockler is a winner in my eyes and I would definitely recommend it to others to purchase! Thank you Rockler for making such awesome Signmaker Templates! Easy to use. Take your time laying out, taping down, and vacuuming between routering passes and will have great results. It does everything as advertised. All parts fit together well and is easy to use. Helpful suggestion for new users. When I started I kept wasting a lot of time finding the correct letters. It was also difficult at times to find the other half or part of a letter for the second run. Here is what I did to speed things up. When you get the box pour all of the templates out onto a table. Take the letters that require two passes and connect them as in A-1 and A-2, R1 and R2, etc. Put all of the single letters into some sort of order Y to Z, W to X, etc. They will not fit back in the box so ...rip out the card board partitions nearest the box hinge. Organize all of your doubles to the back along with all of the other letters. Put the other symbols, etc in the front partitions. This really speeded up my work because I could so easily find what I wanted. When I was not using an A I put the second matching template back together as one. Nice products. I have the 1.5" and the 2.25". With practice you can make some wonderful items. I have used the 1 1/2 " Sign Makers Template Two times on a total of 9 words and it was Flawless , worked very Good . Follow the instructions and there should be no mistakes . I am Happy that I purchased the State Park Font Kit . Easy set up with the wizard. Professional results. First usage yesterday, letters clean as long as you do not use excess force as the templates can bend some. 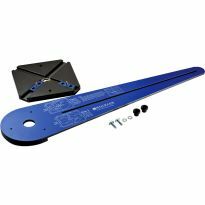 One suggestion: I would recommend to Rockler to make a 2 part "G" as its tail is not well supported and easily bent when applying most any kind of force to navigate a large router. P.S. I was going 3/8 inch deep into Redwood in a single pass. Needed fairly deep because some kind of reflective paint will fill the grooves and Redwood seemed pretty soft to cut in a single pass. - You must use a template guided plunge router! - Practice on some scrap wood first. - Be sure to guide the bit around both edges of the template, especially around curves. - Use the online Wizard to lay out your letters - a no-brainer! I used the larger letter set, and I've already ordered the next smaller size for another project. Well done, Rockler! Easy to use and great results. Using the State Park Font Signmaker Templates is easy and almost fool-proof. Professional looking results. Thank you. It is easy and fun to use, even by someone with limited router experience. Worked great. Just as advertised. I love this kit! I'm new at routing and using this kit was really easy. First time to use Signmaker lettering. I'm a novice with a router and this was easy to use. after getting used to the set, I find it easy to use and it works very well. This is a great, easy to use lettering kit. When combined with the Sign Making Wizard, it is foolproof. Exactly what I was looking for. Software helps with the easy setup and use. After you organize it works great. 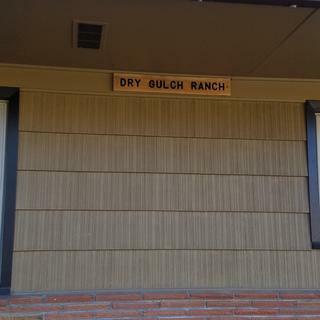 Fun to do and produces great looking signs. Once your router is set up, it only takes 10 minutes per sign for the entire process. I used regular double sided tape, and it worked great. 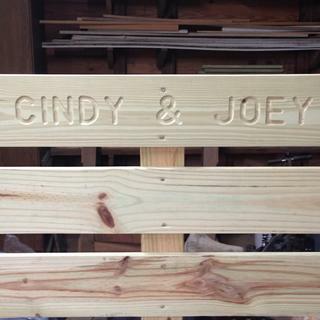 Took a little practice as we are using it on PVC planks, but works and looks great when done! I am not a skilled woodworker but this kit has made me one. I use an old makita plunge router I have had for years and used very little. Watched U tube videos, soaked it all in and bam , great results. The biggest challenge is finding good two sided tape. Finally went with carpet tape but still looking for something easier to work with as you have to cut in half. None of box stores has any good alternatives on tape. Even Rockler web site is not a solution for the tape. Great product. 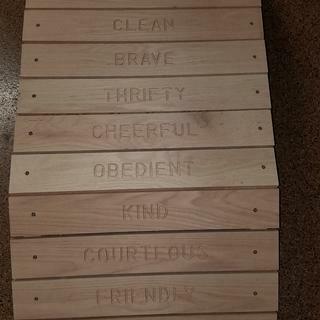 Perfect for my project of making signs on various trails on my property. The only suggestion I might have is I think the W should be in 2 stages. It seems somewhat fragile. Also the Wizard ap needs spellcheck. It would be nice to have other choices of different fonts, an apostrophe etc. 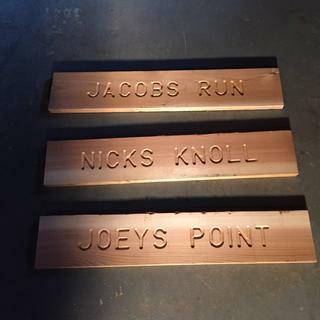 Named trails on our property after our 3 sons! This is my first time ever attempting signmaking. I bought the kit for this particular sign and I think it turned out very well. 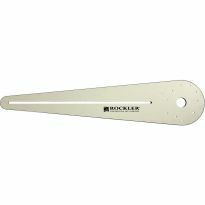 The web site Rockler provides helps tremendously with the layout of the lettering and what to rout first and what to rout second. The toughtest part is finding the spot on their website that enables you to do so. I can't say enough positive things about this product. They worked great the first time i used them. The website is excellent. Easy to set up and made a perfect sign. 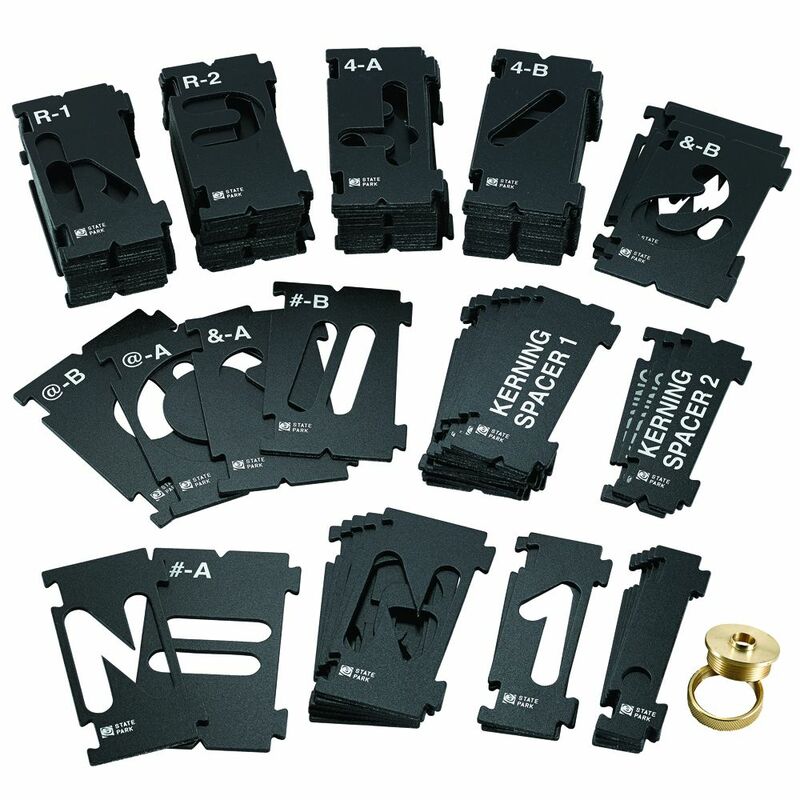 This set works great and the wizard offered by rockler takes all the work out of laying out the letters for you sinage. I would recommend this set . This is a well thought out kit! Great results with this kit for the 'Crossing Over' bridge. Fun projects for rainy days. Anyone with a small plunge router and a bit of experience with it can make great looking signs. This product seems to combine simplicity and effectiveness at a reasonable price. I liked the, "no spaces" feature. i looked at a few different options on other sites and i ultimately chose this option because it had the kerning spacing ability and the two part templates for the A, R, P, ect. To use to make signs to sell. I have always liked the state park font, and will be making signs for friends and family. Recommended for the State Park Font Kit. To try a new hobby. 1 have the 2 1/4 set and wanted a smaller set and happy with the set I already have. 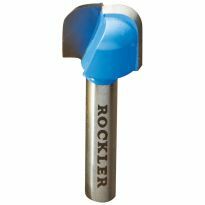 I trust Rockler products and it is the style that I like. The continuous set up capabilities and the spacing solutions. I WOULD LIKE TO MAKE SOME SIGNS AND THIS LOOKS LIKE A GOOD OPTION. 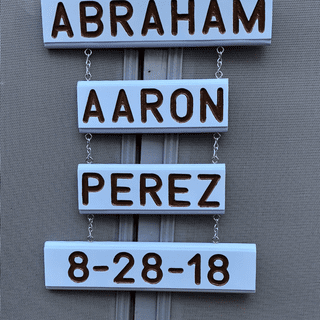 I have the 2 1/4" size and I wanted the other sizes to make some signs. These are very good quality templates. The interlocking feature make them easy to switch. 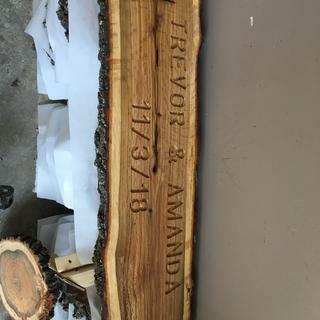 Got a sign to make for a customer and this appears to be what he wants. Something I have wanted to try. Seems t be the most comprehensive kit available. I have enjoyed using the kit and wanted to have all three sizes! I have the mid-sized version and love them! Have the 3 3/8 and 2 1/4 kits and wanted these smaller ones to have the complete set. The kit appears very detailed with the hobby craftsman and professional in mind. I want to try sign making. This kit appears to be easy to use. Ok, just made the cardinal mistake with this kit... I raised the router off of the templat with the router on and dinged the edge of one of the templates. (E) Where can I get replacements? BEST ANSWER: Replacement templates are available through our customer service at 800-279-4441. 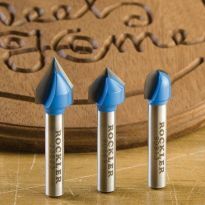 Ok Rockler, I love these sets!! Can you now you need to create a transition template from one size to the other? For example, If I wanted to use the 3-3/8” for the first letter and then the 2-1/4” or 1-1/2” for the rest of the letters. I know I would be buying all the sets and the transition templates. This also gives the illusion of upper case and lower case!! I own a Craftsman Professional 28212 6.5 amp Corded Fixed Base Palm Router but I cannot find anything about it accepting standard guide bushings? I would think it does but I am not sure. How would I tell? Hello, I own the DeWalt router 26204K which is the same as the DWP611PK. The base plate's opening is too large to accept the brass bushing of either the 2.1/4' and the 3.3/8" signmaker's template kits. It looks like the DeWalt base plate could accommodate another acrylic insert disc which should then hold the brass Rockler bushing. Does anyone have any ideas? I use a Bosch Colt to do my signs using and I had the same problem. I solved the problem by buying a router base plate from Rockler. The universal base plate works well and will accept the bushings. Can I use a palm router? BEST ANSWER: I am using the Bosch Colt Palm Router with the plunge base. The plunge base is absolutely the way to go with the brass guide collar. Simply seat the brass collar into the letter template. Make sure you are properly seated into the template. Then turn “on” the router, plunge down and follow the letter template. When the letter is complete, plunge up and turn “off” the router. Wait for the router to come to a complete stop and remove. That’s it; you are done! 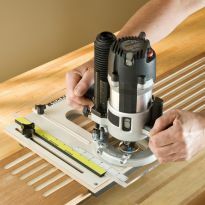 I use a Bosch Colt router with the plunge base and it works perfectly - much easier to manage than a full size router. However I have used a full size router prior to getting a palm router and the results are identical. Per one of these questions/answers i bought the Bosch colt PV20 router with plunge kit. Only problem is that the base plate opening that it comes with is way too big to mount the brass bushing.as recommended here by Rockler. You MUST order an adapter base plate with smaller opening for the bushing. It would have been nice if someone had mentioned that the Bosch Colt apparently does not use "standard" openings for the bushings. I have had to order yet again to get everything I need to make the sign template kit work well. Yes but you really need a plunge or you risk cutting the templates if you don't drop it in perfect or if the bit catches and pulls. With a plunge you start with the bushing in and drop the bit in. Yes you can. Be sure you buy the plunge attachment if you don't already have it. Getting the bit centered in the guide bushing is important. 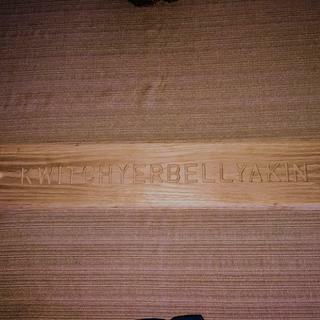 I am not real good with a router so how do you line the router up to where you don't wind up cutting your letters when you first go into the wood?? You need a plunge router and a brass bushing. Make sure the bushing is against the edge of the template, then plunge. I have made 30 plus signs. Use a plunge router and the supplied guide bushing and any problems you might be having will be solved. The kit comes with a brass guide bushing to line up the router. It is easier to use a plunge router. How wide are the letters in the 3 3/8" State Park set? BEST ANSWER: The letters once routered are approximately 2 1/4" wide however that does not include the space between the letters. To calculate the length of your word it would 2 5/8" for the first letter, 3" for each letter in the middle and then 2 5/8" for the last letter. A typical 7 letter word would be 20 1/4" long. The letters M and W are a bit longer at 3 3/4 (including the spacing) and the i is a little over an inch. And all of this does not take into consideration the kerning ability of the set to produce tighly spaced words for certain letter combinations. letters "M" and "W" are 3.25 inches. most other letters 2.5 inches wide. letter "I" is .75 inches wide. Can two different size letters be used on the same line? BEST ANSWER: Yes, however not at the same time. The different sized letters will not lock together. I used a pencil to establish a base line and worked from that. Practice on scrap lumber first. The results will be worth the care you took. Is there a way to know before hand what the length of you text will be using the wizard? Interested in the 1 1/2" and 2 1/4" State Park templates. BEST ANSWER: I wish the wizard was that smart, but it is not hard to estimate if you knew the width of each letter. Most letters in the 2 1/4" set are 2" wide, the letter I is smaller at a 1" and M and W are wider at 2 1/2" wide. If you have kerning spacing it will be a little smaller. Count the letters times 2" each and it will be close. For the 1 1/2" set the letters are 1 1/4" wide, I is 1/2" wide and M and W are 1 5/8" wide, like the other set Kerning spacing will make it a little smaller. So count the letters in your word times 1 1/4" and that will be approximate. Can the templates be used vertically? BEST ANSWER: I see no reason why not. You must adhere the templates (use double stick tape or just tape it from the front in such a way it doesn't interfere with your router). Yes. I helped my grandson on his Boy Scout Eagle project which included replacing numbered campground posts. 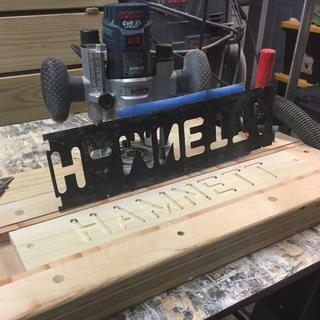 I fabricated a jig using the two halves of the numeral "8" template. I just bought numerals. The jig had a spacer between the two so that the vertical spacing looked OK using the top two tabs for the top numeral and the second and third tab for the bottom. The fourth tab is unused. The templates were mounted on a 1.5 inch square wood which is clamped to the 4x4 post with a bar clamp. Using the templates vertically requires moving each letter each cut because there is a much larger distance between letters tops and bottoms then side to side. Yes, I have successfully used them vertically. How do I get the wizard to display longer names? BEST ANSWER: Unless the word has more than 20 characters, you can simply break up the "phrase" between words and add a "space" between them, then enter the rest of the phrase. Spaces between words are consistent. You might not have enough of your letters if there's an abundance of one or more. You can solve this by "temporarily" inserting another letter of the same width and "ignoring it" until you can move a completed letter into that space (tape over the one you don't want to route so you don't "forget")... or buy multiple sets of stencils to get enough letters if this is something you will be doing often. You need to buy a router bit. 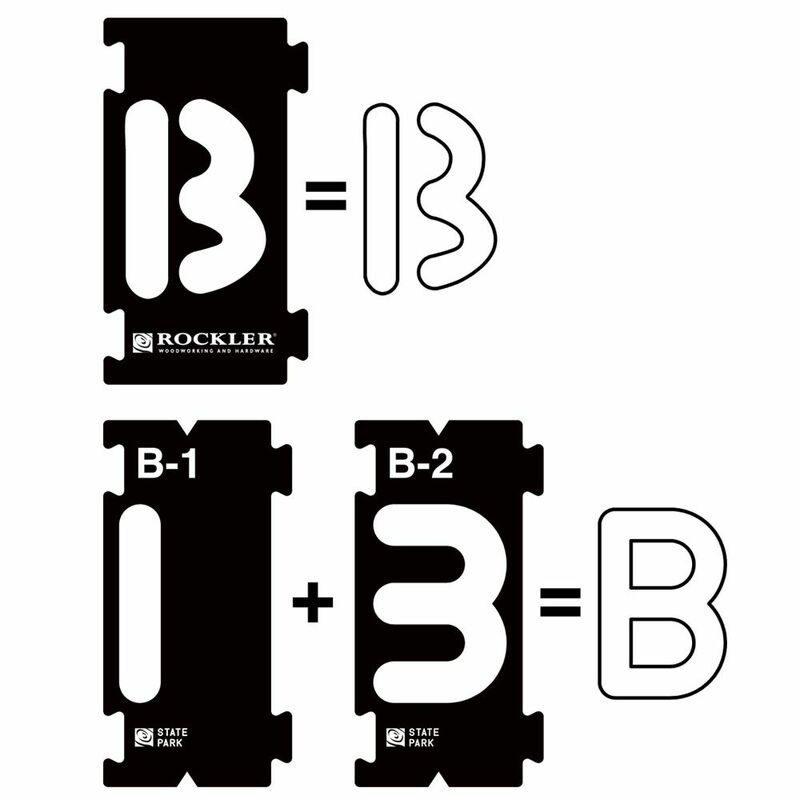 The people at Rockler can help you find the right one. I bought my bit at the same time I bought the sign making kit plus I bought a "baby router" (hand held plunge router - also from Rockler. Do I need a special base plate? BEST ANSWER: Your router will need a base plate that accepts a standard guide bushing. See Rockler item 35062. The signs I make turn out very well and I enjoy making them. Can I purchase more letters? BEST ANSWER: It's fairly easy, you just call customer service and request the letters and/or symbols you would like to order for the specific letter set you have. They will process your order for you. yes you can had to before the first time I used mine the router bit went through one of my templates. I called Rockler they replace them for me. Yes you can buy letters separately. how do I make an arrow? BEST ANSWER: You could use 2 or 3 letter I with a v.
Turn an "I" sidewise and a "V"
Have you tried this method? I just purchased the kit and have not much experience with it yet. Has the numeral "5" been updated to a two-pass item (like they did with "G")? Even being careful I had trouble with the inside part bending. Thanks. BEST ANSWER: My kit has a 2 part "G," but the sign making wizard uses a 1 part "G." Which one is the correct method? They will both produce an identical letter "G" The problem with the older single-part "G" is that the inside part "bends" if you're not very careful with the router. Rockler upgraded to a two-part "G" that prevents this problem. Apparently they have not updated the wizard. So you just make one pass with your first-part "G" then a second pass with your second-part "G" Hope this helps. Great. I was afraid there might be issues with the kerning with the two-part "G."
3.) the ability to set the the letters in an arc? does this set come with all the letters in the alphabet? It's s really complete set with multiple of common letters. And it takes care of kerning letters such as A next to V.
Yes you can make all letters of the alphabet. Yes, and a few doubles. Why is double sided tape recommended? Can't you use duct or gorilla tape? BEST ANSWER: Craig, I use painter's tape (blue or green) with some satisfaction. The problem remains that the router base plate tends to "snag" the tape. I have not found double-sided tape to grip the template assembly firmly enough, therefore the preference for the thin painter's tape. I tape firmly where I am NOT routing and release the tape as I move forward. Carefully dust off where you have routed and firmly re-tape the routed section as Iyou move on. Cumbersome, a bit, but it gets the job done! Thank you so much for your response. I have been having trouble with the bushing jumping out of the templates and causing damage to the letters. I'm sure it was because of the tape I used. Thanks again. I have used painters masking tape a few times, and it works, but using the double sided tape works the best. Using duct tape of gorilla tape creates a rough spot on the template and the router will have a tendency to catch it and hang up. You want to keep the top surface smooth so you can feel your router against the template. Double sided tape helps to create a firm hold for each stencil. Duct tape could also work, but you would have to be extra careful that the stencil doesn't shift while routering. Good point. I know my stencils shifted and that is why I ruined a few letters. Thank you. Duct or gorilla tape will leave sticky adhesive on the wood that will affect a stain finish. No big deal if you are painting, but stain will look splotchy. That's true. I didn't think about that. Thank you. Holds the templates secure onto the work piece better. I have had templates move out of place with the use of duct tape. Because Gorilla or Duct tape only adheres to one side. Either to the base or to the letter template. Enjoy. That certainly makes sense. Thank you. Will this work with Makita 6.5 amp compact router? BEST ANSWER: Have not used a compact router with my template set but don't see any reason that it wouldn't work provided that the base will accept the guide bushing. Be sure to use the double sided tape to hold the templates in position. Maybe, it needs to be able to use the brass guide bushing. Makita refers to these at "Template Guides" A bushing comes with the letter set, and they do seem fairly universal. If your router accepts standard guide or template bushing I would think it should work. But I am not familiar with that Makita router. What router base do I need to use these? BEST ANSWER: If you have one, a clear router base would be best. Also, I would recommend a full size router because of the larger base or make you own larger base for your router. I use a plunger base with a plate that takes the brass bushing. Be careful and make sure that the templates lay flat on the wood surface while using the router. I use my standard router base, with a guide bushing that actually comes with the kit. Any base as long as you have the correct inset that fits in the stencil. 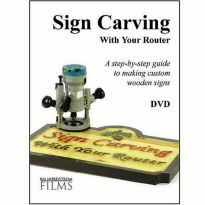 What is the best router for sign making? Best all around router? 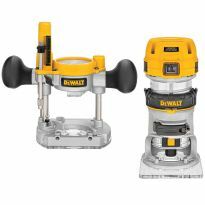 BEST ANSWER: I use the DWP611PW Dewalt router with plunge base, it lets me go as shallow or as deep as I want. It is a great router, it has enough power to use on any type of wood. 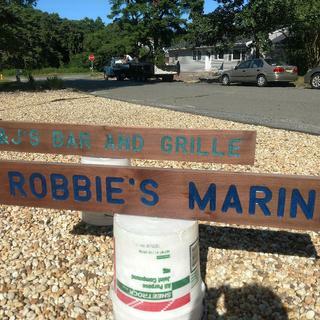 It is very versatile with all types of projects not just sign making. I am currently using an Hitachi 2.25 hp fixed/plunge router combination unit and have had no problems. A router bit depth gauge comes in handy, saving time, but eyeballing it works too. The fixed router set up is great for all other routing chores. Sufficient power is available with the Hitachi. BEST ANSWER: this kit is designed to keep the spacing between letters right. It even takes care of the fact that some letters need to be closer to the next one than others. this is called kerning. the individual letters/numbers in the set lock-in together so the spacing is fixed. To make any adjust otherwise would require manual manipulation of each template piece. OK so if doing that would it be difficult to keep things straight? Will this work with a Dewalt DW618 router? BEST ANSWER: Yes. The key is to use the right size router bit and guide bushings. Be careful during the routing because if the bit is not centered in the bushing, it will destroy the bushing. Not an expensive problem, but you will need another the same size to work with that size bit, 3/8" or 5/8". I hope this helps. I really like mine and have done some nice lettering with it. Yes. You will have much more success and safety if you get the plunge base for that router. 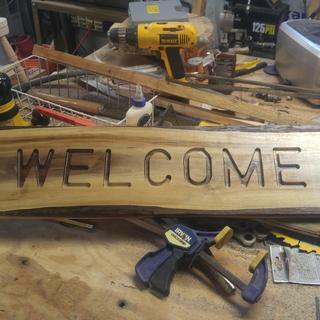 I want to make signs with a fairly dark wood finish and bright yellow letters. Similar to what is in the background of the Rockler video. Any suggestions as to how to do this? BEST ANSWER: I did the opposite of what you’re trying to achieve, but I believe the order would still be the same. Paint the letters first, you do not have to be perfect, then sand the face of the wood and finish. The sanding will perfectly take away any overage. Hello mikelv. I made a sign with the Adirondack theme. I used rustoleum leather brown for the back ground and rustoleum sun bright yellow for the letters. I have painted the letters and ran the sign through a planer to clean up the letter edges. Worked really well. Re: 2 1/4" kit, can you make a hyphen? Can you make a comma? BEST ANSWER: Tape router stops the same thickness as the templates in the vertical sides ah the letter H and just rout the middle for the hyphen. I just freehand the comma because it is so small. I looked through all of the templates and did not find a hyphen or a comma. However, by using the "B" template for the letter A, it will work as a hyphen, I think. You can make a hyphen from the center bar of the "A" and there is an apostrophe that can be used upside down for a comma. For the 2 1/4" State Park stencil kit, what is the physical size (not the letter size) of the single largest piece? BEST ANSWER: Hi Richard. Rockler asked me to answer your question. Unfortunately, me set is 3-3/8 in., so I cannot give you an accurate answer. For my set, all pieces are 6-1/2 in. high; most letters/numbers are 3 in. wide, but the @ pieces are 4-7/8 in. wide. All of the pieces are 4 3/8" tall. 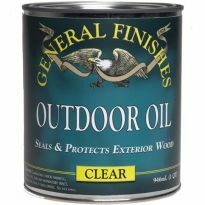 Has anyone tried this on an uneven surface such as barnwood? BEST ANSWER: No I have not, however I think the only difficulty would be in making sure the templates are secured well to the board. I don't know . If the surface is not planed or sanded the bit will not go the same depth. I wood try it on a scrap first. It comes with a Brass Bushing but they note that it requires a brass bushing. I'm confused. Does the kit have everything i need? BEST ANSWER: Yes it comes with everything to start making signs. It's been a couple of years since I bought this kit. I don't recall if it comes with anything but the letters. The web page I read does not say a bushing is included. You will need a plunge router and appreciate bushings and router bits. Very satisfied with this kit. Do you have to use their bit or can you use a V Groove bit instead? BEST ANSWER: YOu can use the V groove instead of the one they give you . The one they give you has a fine point that's used to do fine art router work. I have only used their bit. However, its the shoulder of the bushing that guides the bit around the templates so I expect you could use any bit that is not bigger than the bushing. Rockler Signmaking Brass Bushing, 1/4'' I.D. x 5/16'' O.D.